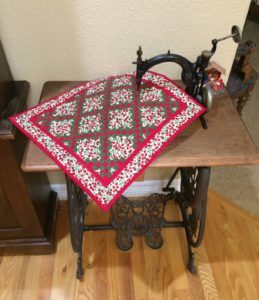 I want to share a few little Christmas Quilts with you today but before I do, I must share a little more about our 2017 Follow Along with Phyllis Project. You can see the illustration to the right (54″ x 54″). This will be our CO Log Cabin Medallion Quilt. January we start with the center Log Cabin Block and then each month after that we will add another border. The exciting extra part is that each month you will also be able to make a little quilt from just the blocks in that month’s border. Signups will begin in two more weeks – either on the web site or in person. I am just finishing up the quilt top so I should have it quilted, photographed and at Wooden Spools soon! It is so much fun to make and it truly celebrates our great state. Once again, I will tell you that there will be more details in two weeks. Now on to Christmas Quilts. If you are like me, you probably started to decorate your home this past week after Thanksgiving was over. 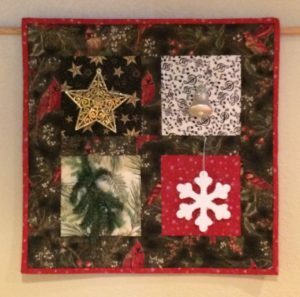 I just love pulling out all my Christmas quilts and decorations that have been made or collected over the years. This first one is so simple – my mother made it about 25 years ago – but isn’t it sweet? She loves to use eyelet lace around the edges of a quilt. 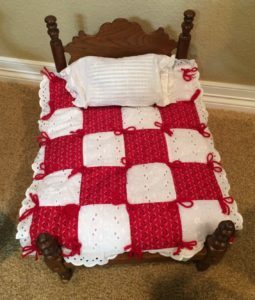 It is tied with red yarn and fits nicely on an antique doll bed. The next one (to the right) is shown on my antique treadle sewing machine, and no, I didn’t sew it there – only for display. But I love to pretend that it is just having the final stitch put on by the machine. It is a little double Irish Chain quilt pattern in red, green and white. The Star is for wishing on, and it’s to show you that no matter what you’re wishing for, I’ll be wishing too. The Bell is to keep the music and the laughter in your life. The Snowflake is to remind you that you’re unique, an original, a very special person. And the Evergreen is just my way of promising you that we’ll always be friends. ← We’re opening early Sunday, 11/27 for the final day of our big sale!